The USB 3.1 Type-C to HDMI+USB3.0+Type-C/F adapter is a great companion for your 12 inch Macbook or Google new Chromebook Pixel. With this adapter, you can enjoy Full HD video on monitor/projector/TV with HDMI port from your type C supported computers. You can also connect your USB 3.0 devices to your type C supported computers. The type C/Female lets you charge your Type-C computer easily. Combining the port of HDMI, USB3.0, type C/F into one, the Type-C to HDMI+USB3.0+Type-C/F adapter allows you to connect your type C supported computers to the devices with HDMI port and other devices with USB3.0 port. The type C/F offers you easier charging way. The type C/Female port allows you to charge your 12 inch Macbook, Google new Chromebook Pixel. The video resolution is up to 1080p@60Hz, enjoying Full HD video output at a larger monitor with HDMI port. Certificated by FCC and CE, please rest assured to use this product. 1.Type-C female connector only support charging, do not support data transfer. 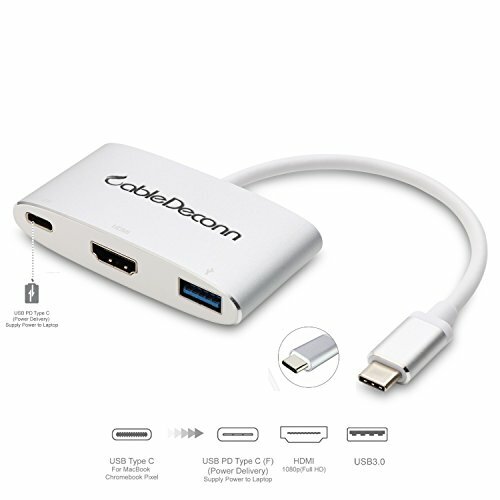 2.When connecting this product to Chromebook, the USB3.0 port sometimes can not work normally. This problem is caused by the incompatibility of the Chromebook system, not by the product itself.